There’s a gooey time capsule in the heart of Los Angeles, left over from an era when saber-toothed cats, dire wolves, camels, and giant sloths prowled southern California. At the site known today as the La Brea Tar Pits and Museum, natural asphalt has bubbled up from below the ground’s surface since the last Ice Age. This murky sludge has trapped and made fossils out of thousands of creatures, as small as bees and as big as mammoths. Here are a few of the amazing discoveries made there. 1. MORE THAN 3.5 MILLION FOSSILS HAVE BEEN DISCOVERED. The tar pits have yielded one of the biggest collections of Ice Age fossils in the world, and collectively, the statistics are stunning. More than 600 species have been found, from snakes and mollusks to sloths and mountain lions. Of the mammals found at La Brea, around 90 percent are carnivores. (Amazingly, the pits have yielded more 200,000 individual dire wolf specimens alone.) The common explanation is that when big herbivores like mammoths got stuck in the asphalt, they would have looked like an easy meal to predators—who would then become stuck in the tar themselves. 2. PALEONTOLOGISTS STILL DIG THERE 361 DAYS A YEAR. 3. THE ONLY DINOSAURS FOUND THERE ARE BIRDS. After the paleontologists at La Brea have convinced you they aren’t robots, they’ll be quick to clear up another misconception: They don’t dig up dinosaurs. (Although, technically, they do. “We have 163 species of birds,” Lindsey says. Yes, birds are dinosaurs.) Most of the fossils at La Brea date from 11,000 to 50,000 years ago—about 65 million years after dinosaurs went extinct. 4. THE PRESERVATION OF FOSSILS IS EXCEPTIONAL. Sticky asphalt is a pain to clean off the bones, but it also keeps them in pristine condition. This means scientists can look at features as subtle as the markings on carnivore teeth. One study in 2014 looked at microscopic patterns on the teeth of five species of big cats found at La Brea. The researchers concluded that the mountain lion was the only one to survive into the present because it wasn’t a picky eater, and could survive changes in its food supply. 5. IT’S SO GOOD THAT THE PITS PRESERVE ENTIRE ECOSYSTEMS. This is important because the presence of smaller organisms can relay more specific information about the ecosystem. And because La Brea has such a long record of fossils, scientists can track how those ecosystems changed—or didn’t—over time. For instance, one recent study of beetle fossils in the tar pits suggests that the climate of southern California has been relatively stable over the past 50,000 years. Yes, L.A. has had great weather for a very long time. 6. THE TAR PITS ARE DEATH TRAPS—AND YET ALSO SUPPORT LIFE. A decade ago, scientists discovered about 200 species of microorganisms living in the asphalt with no water, little to no oxygen, and a heavy dose of toxic chemicals. Some of these microbes represented families of bacterial species that had never been seen before. By studying extremophiles thriving in such hostile environments, scientists may learn more about how life might exist on other planets. 7. ONLY ONE HUMAN SKELETON HAS BEEN FOUND THERE. In 1914, researchers at the tar pits discovered a 9000-year-old set of human remains of a 20-something-year-old female, dubbed “La Brea Woman.” Though some had speculated that she had been trapped in the asphalt or that she was Los Angeles’s first homicide case, later studies suggested La Brea woman’s remains had been ceremonially reburied in the asphalt, possibly with a domestic dog at her side. No other human remains have been found at La Brea. Historical accounts suggest that local tribes like the Chumash and Tongva used the asphalt from the tar pits as a glue or caulk for their wooden boats, so they must’ve tread carefully around the tar pits. But most of the fossils from the tar pits date from the period before humans populated the region. Lindsey says a new project will look at what was happening at the tar pits during the Holocene—the period that started after the end of the last Ice Age—which could reveal how the arrival of humans might have contributed to the extinction of big mammals. 8. A POLICE DIVER WORKING A MURDER CASE SURVIVED A PLUNGE INTO A PIT. 9. THERE ARE MORE PITS OUT THERE. “There’s a couple of sites that have barely been studied but would probably be as rich as the La Brea tar pits,” Lindsey says. Venezuela has several tar pits, for instance, but because of the political situation, they haven’t been as intensely studied. 10. THE NAME IS REDUNDANT. 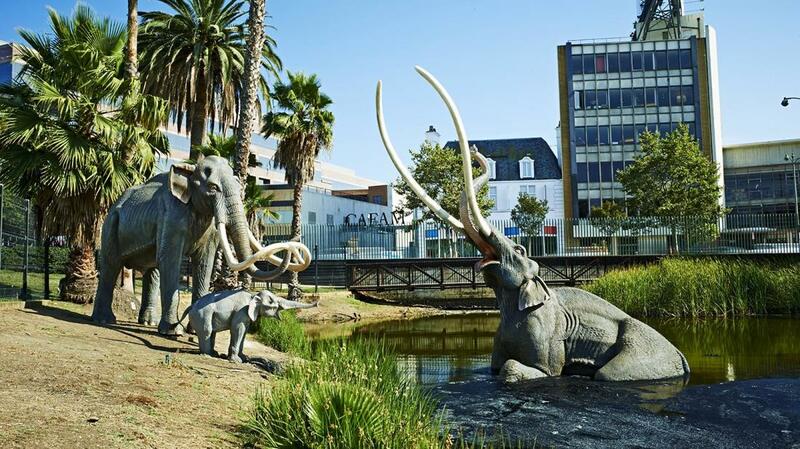 “La Brea” in Spanish means “the tar.” So when you say “the La Brea tar pits,” you’re really saying “The the tar tar pits.” It’s on the long list of tautological place names that also includes Lake Tahoe and the Sahara Desert.